This commissioned series of Latte Cups, developed through Craft’s Aboriginal Projects, explores and celebrates a diversity of practice and narrative between four leading Aboriginal artists - Vicki Couzens (Gunditjmara, Keerray Woorroong), Lee Darroch (Yorta Yorta, Mutti Mutti and Boon Wurrung), Kent Morris (Barkindji) and Peter Waples-Crowe (Ngarigo). 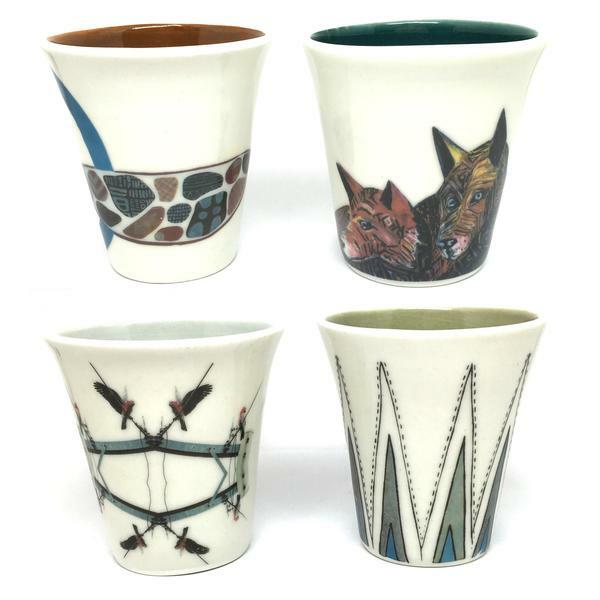 Each cup is made in Victoria by potter Ingrid Tufts before the translation of the artist's work is applied to the surface. High fired to over 1200 degrees, the work is both dishwasher and microwave safe. Place in the river where the fresh water meets the salt water. Peter Waples-Crowe an awarding winning artist who’s visual and performance practices play in the intersection of identity, race and culture. Influenced by my Ngarigo heritage, my practice explores the areas of dislocation, globalisation, popular culture, spirituality, sub-cultures and Indigeneity. Using various techniques including cut and paste appropriations, and mixed media applications my practice attempts to locate and map a sense of belonging and position in contemporary Australia. My practice also explores the cultural constraints and perceived rigid categories of being a ‘native’ artist and seeks to expand this constrained identity, away from the ignorance of Australia’s brutal and problematic past. This shifting role enables my practice to explore in-between territories and expand alternative spaces and realms for Indigenous and other people to inhabit and occupy. The dingo is very much misunderstood. The alpine variety traditionally inhabited Ngarigo Country but they were seen as pests by many colonists and have been destroyed in great numbers and still are. This cup celebrates Australia’s native dog, its importance to the land and the hope that someday it will be protected. Kent Morris is a Barkindji man, artist and curator. His artwork explores the connections between contemporary Indigenous experience and contemporary cultural practices, and their continuation and evolution. Birds form an intrinsic part of Indigenous cultural knowledge and spirituality. Seeing how they have adapted to the built environment, to technology and colonialism, reflects to me how Aboriginal culture survives and continually adapts. Lee Darroch is a Yorta Yorta, Mutti Mutti and Boon Wurrung woman, who has lived on Raymond Island in the Gippsland lakes with her partner and two children for the past 29 years. She is an artist and community cultural worker and her practice is inspired by the need to continue cultural, spiritual and artistic practices. Darroch has run her own business, Gurranyin Arts for over 22 years. She feels guided in her artwork by the Old People who have gone before us and by her Elders today and hopes to leave behind a rich legacy for her children and children’s children to follow, so that the Dreaming will continue in an unbroken line. This image depicts a long journey I made over a couple of days from where I live in the Gippsland lakes over the mountains to the Country my father was born on. It was snowing on the mountains, a complete white out and the trip took hours and hours. Two days later, the journey resumed to Kaila (Goulbourn River), Rushworth and finally a sacred site at Whroo. This was Dad’s story. I am re-telling it.